Well hey there, lovelies! Happy Monday! I thought today was the perfect time to share my January Office Styling with you - since last week I gave you the DIY Fabric Wall Hanging Instructions that I used to make the hanging on my peg board this month. After Christmas, my office felt a little bit bare after taking down all of my decorations - so I decided I'd start decorating each month of the year as well! 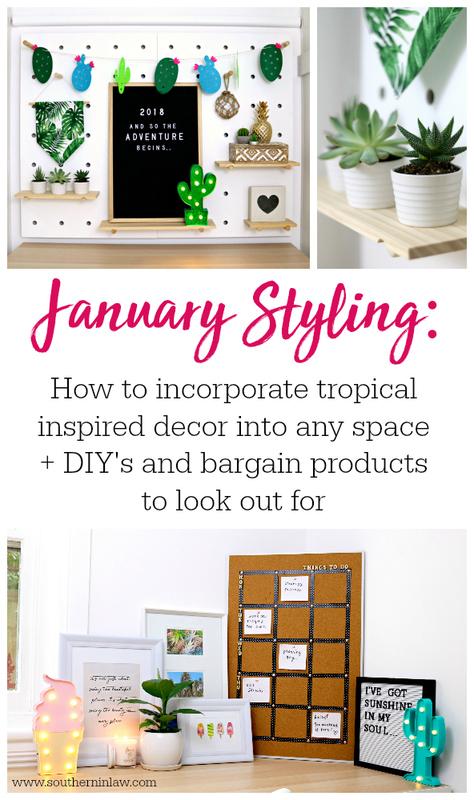 This post will be relatively short and simple - but I thought I'd share my tips for creating a tropical inspired decor look whilst also sharing some of the pieces used in the room that you might want to buy yourself! You can have all the ideas in the world and pin all the pins in the world - but you really need to find what's going to work for you. Sure, a macrame hanging chair would be lovely - but is it going to work in my small office? Probably not. 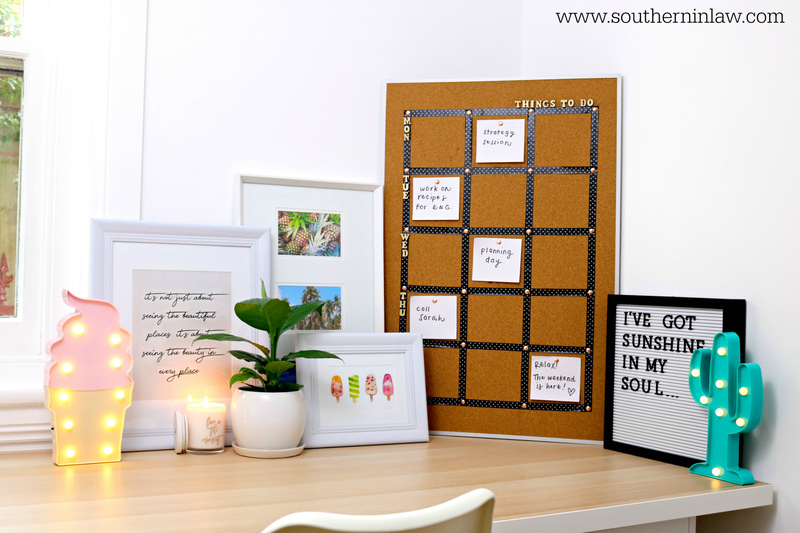 In my office, I had two main areas to work with - my office and my desk. Updating your decor shouldn't mean that you have to go out and buy everything new. For this theme, I started with what I had. The felt cactus bunting, succulents and the cactus candles I received as a Christmas gift. 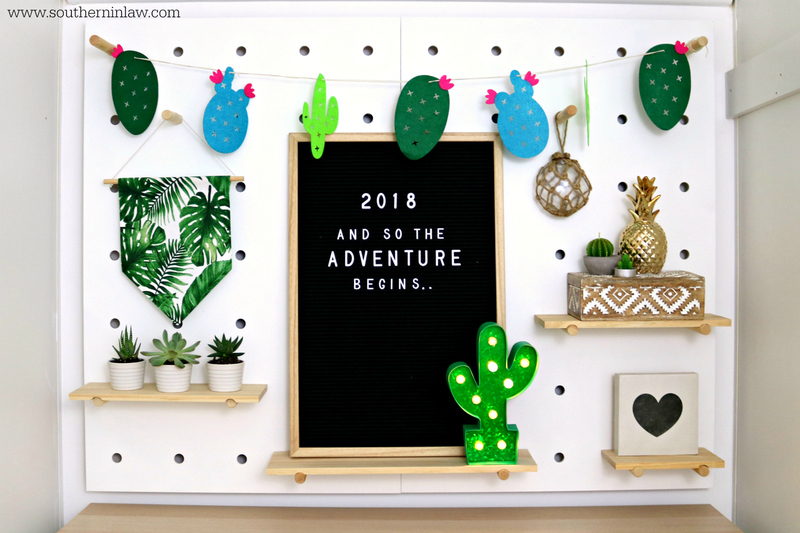 I also incorporated my felt letter board and a bunch of different frames that I had picked up at TK Maxx a few months ago for a different project. Sure, I probably could have decorated the room using only pieces from Kmart - but I get kind of tired of seeing the same thing over and over again - and I don't really want to decorate with things that I have seen in 10 of my friends homes as well. As you probably already know, I'm obsessed with TK Maxx because it's a bit of a treasure hunt. You can rarely find the same thing twice, the bargains are incredible and their home decor pieces are so well made and absolutely gorgeous. 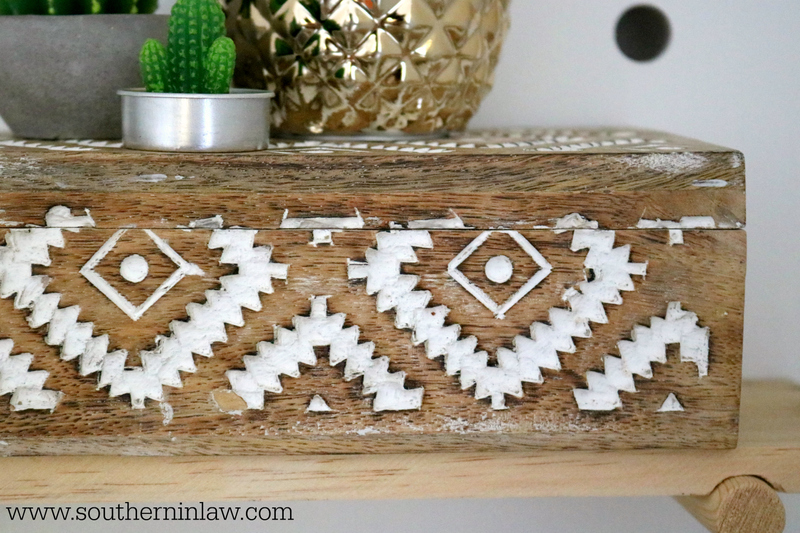 I picked up this hand carved wooden box which I love for just $12.99. Also, I see people in TK Maxx all the time browsing at things and not picking them up or talking about going back for them later. As a general rule, ALWAYS buy it - because it won't be there when you return. Stock is turned over really quickly and they rarely have more than one or two of each item. You're never too old to have a little fun. 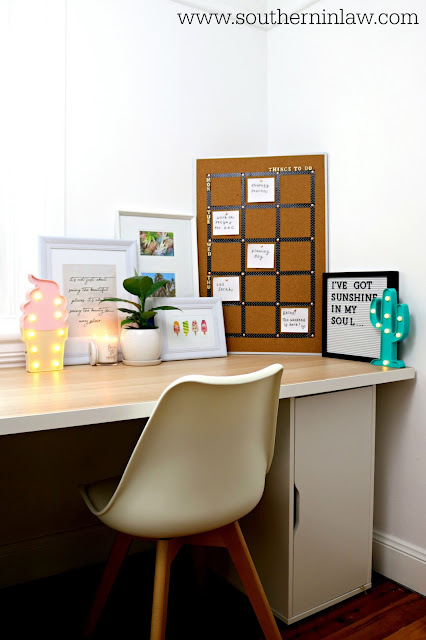 I picked up the cactus and ice cream lights on clearance at Kmart after Christmas (for just $2.50 each) to add some light and fun to the space. I also found similar lights at TK Maxx and online here and here. 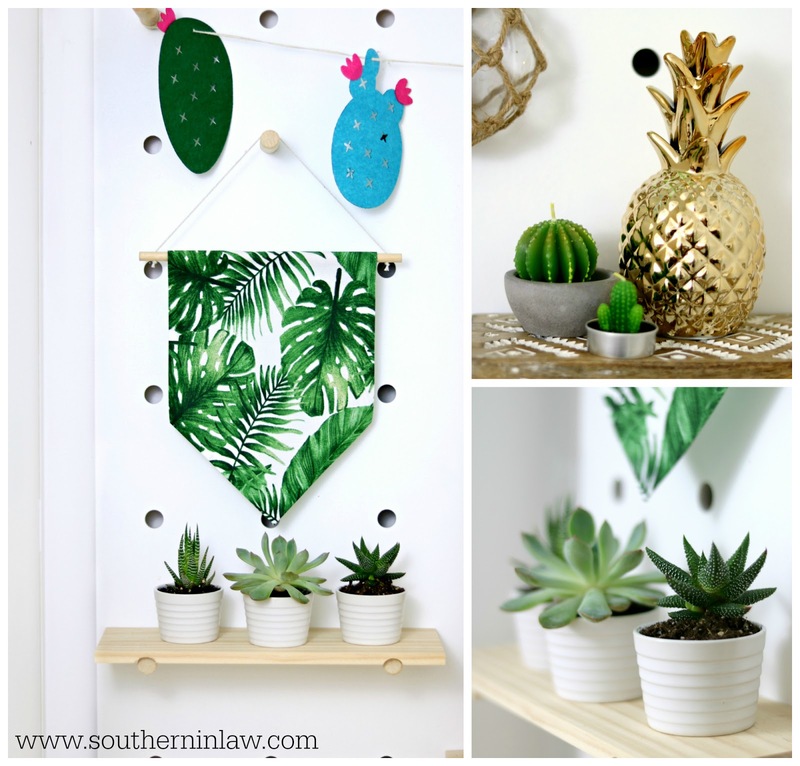 If you're going for a tropical/summer thing - plants or flowers are a must! I went with plants as I always feel bad when fresh flowers die. For my office, I added a peace lily and some succulents for a pop of colour.... and also because they're both types of plants that are quite resilient which is a MUST for my black thumb. Oh - and make sure you add some candles too! 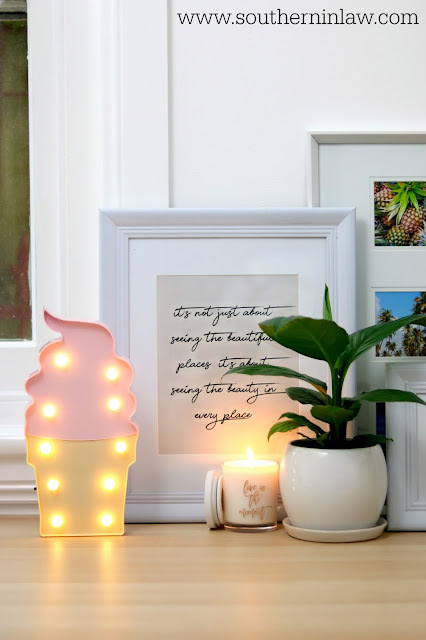 The Coastal Collection Candle from Innoscent is one of my current faves - and perfect for my summer theme! But tell me, where do you usually shop for home decor items? And if you had to decorate in just one theme or style - what would you choose? I really love Hamptons Style homes - but I don't know if I could stick to just one theme or style. I like a little bit of everything as I like to incorporate what I find interesting/beautiful and work it all together.